In “Ullishusen”, Oldenstadt’s historic centre, a Benedictine monastery had been founded already by the middle of the 10th century. 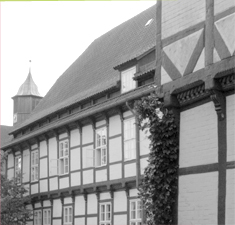 Ullishusen gained certain reputation and importance, and around 1250 the citizens of Ullishusen moved from their settlement to the opposite side of the Ilmenau river, where Uelzen’s old town is located. Today, the former church of the monastery is the central point of Oldenstadt’s historic centre. In the Langhaus, lessons will take place as well as the opening concert (June 28, 2013 at 7 PM), the musicological lecture (June 30, 2013 at 7 PM), the Chamber Music Concert with the Wratislavia String Quartet and participants (July 3, 2013 at 7 PM) and the Final Concert (July 7, 2013 at 7 PM). Next door, in the Music School, practising is possible almost all day long; meals and accomodation are located in the youth education centre which is located next door, too.